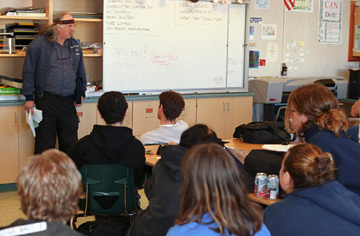 A veteran talks to teenagers at a local high school about military recruitment fact and fiction. Veterans Education and Outreach Project activities are many and varied. They range from preparing videos on the issue of violence, placing ads and notices in local newspapers to notify the public about issues of importance, making presentations at public and private forums, helping to promote and sponsor major events such as the Peace Marches in Eureka, and making presentations on college and high school campuses. One of the most pressing needs that VEOP members address is to speak with students who are considering enlistment in military service. Military recruiters must be seen for what they truly are: salesmen for whatever branch of the service they represent. They are trained to seek youths who often have limited post-high school options and are skilled at making a pitch most attractive to their target audience. VEOP members who have spent time in the services, many of whom also have combat experience, are uniquely equipped to separate fact from fiction about military life. We do not persuade people to follow one path or another; that decision must be made by the potential recruit and his/her loved ones. As veterans, we do feel an obligation to the youth of our community that they be fully informed before they make a decision that could egregiously impact their lives -- or even end them.